Arrow Films’ Arrow Academy label has announced the highly anticipated deluxe Blu-ray release of Robert Altman’s seminal The Long Goodbye. The restored Blu-ray disc will be available to own in the UK on 2nd December, marking the first time that this classic piece of 70s cinema will be available on the Blu-ray format in the UK. Shot by the Academy Award-winning cinematographer Vilmos Zsigmond (Heaven’s Gate, Close Encounters of the Third Kind), a regular collaborator of Brian De Palma, Woody Allen and Robert Atlman the film was treated to a unique process in post-production whereby Zsigmond flashed the negative with light, partially exposing it, giving the film a muted look with desaturated colours and very low contrast. To ensure this was faithfully rendered on The Arrow Academy Blu-ray Zsigmond provided detailed colour notes so the master could better match the original intended look. The processes the film went through are explained in more detail on the extras contained in the disc and the booklet. When private eye Philip Marlowe (Elliott Gould) is visited by an old friend, this sets in train a series of events in which he’s hired to search for a missing novelist (Sterling Hayden) and finds himself on the wrong side of vicious gangsters. So far so faithful to Raymond Chandler, but Robert Altman’s inspired adaptation of the writer’s most personal novel takes his legendary detective and relocates him to the selfish, hedonistic culture of 1970s Hollywood, where he finds that his old-fashioned notions of honour and loyalty carry little weight, and even his smoking (universal in film noir) is now frowned upon. 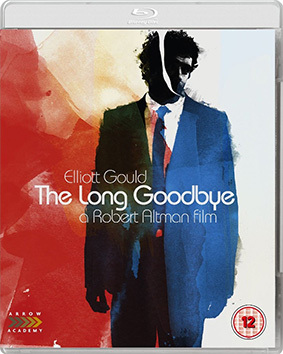 The Long Goodbye will be released on UK Blu-ray by Arrow Films as part of the Arrow Academy label on 2nd December 2013 at the RRP of £19.99.